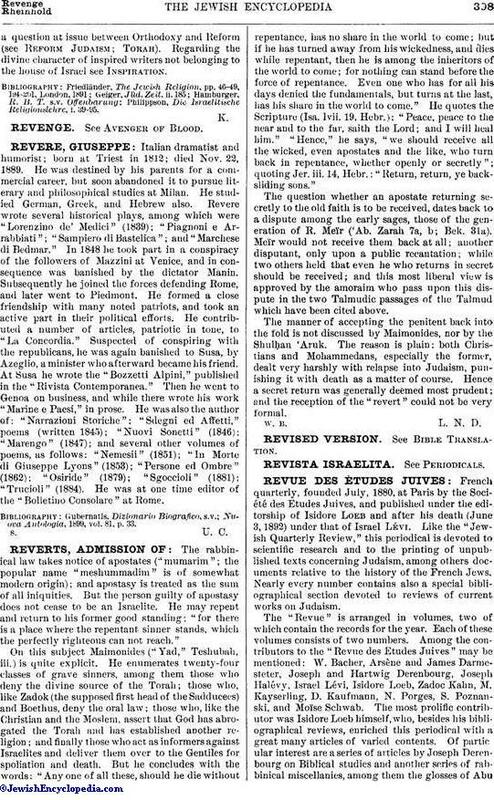 French quarterly, founded July, 1880, at Paris by the Société des Etudes Juives, and published under the editorship of Isidore Loeb and after his death (June 3, 1892) under that of Israel Lévi. Like the "Jewish Quarterly Review," this periodical is devoted to scientific research and to the printing of unpublished texts concerning Judaism, among others documents relative to the history of the French Jews. Nearly every number contains also a special bibliographical section devoted to reviews of current works on Judaism. The "Revue" is arranged in volumes, two of which contain the records for the year. Each of these volumes consists of two numbers. Among the contributors to the "Revue des Etudes Juives" may be mentioned: W. Bacher, Arsène and James Darmesteter, Joseph and Hartwig Derenbourg, Joseph Halévy, Israel Lévi, Isidore Loeb, Zadoc Kahn, M. Kayserling, D. Kaufmann, N. Porges, S. Poznanski, and Moïse Schwab. The most prolific contributor was Isidore Loeb himself, who, besides his bibliographical reviews, enriched this periodical with a great many articles of varied contents. Of partic ular interest are a series of articles by Joseph Derenbourg on Biblical studies and another series of rabbinical miscellanies, among them the glosses of AbuZakariya ibn Bal'am on Isaiah (Arabic text and French translation). Of no less interest are J. Halévy's "Recherches Bibliques," a series of articles on Biblical archeology containing also the Assyrian texts of the correspondence between the Asiatic rulers and the Egyptian kings Amenophis III. and Amenophis IV. 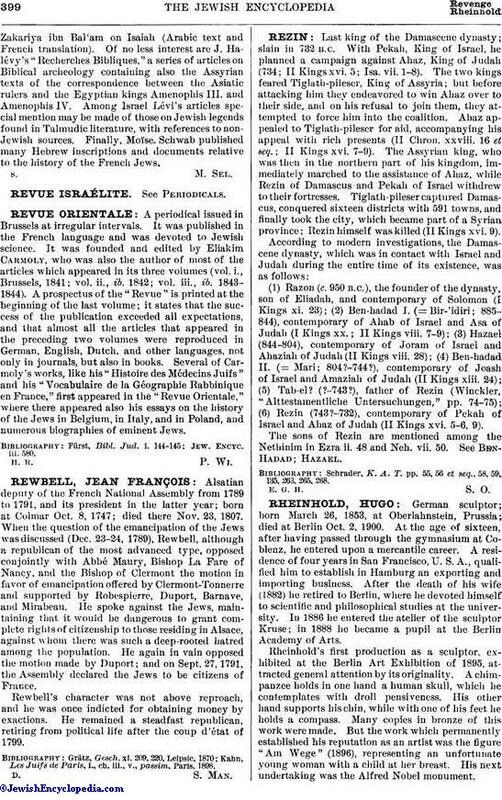 Among Israel Lévi's articles special mention may be made of those on Jewish legends found in Talmudic literature, with references to non-Jewish sources. Finally, Moïse, Schwab published many Hebrew inscriptions and documents relative to the history of the French Jews.